Microsoft’s Director of Program Management for Internet of Things has taken to the Windows blog to announce another device coming to the support list by Windows 10 IoT, as well as some updates on their partnership with Arduino. First revealed at WinHEC 2015 in Shezhen, China on stage with Qualcomm, Dragonboard 410c support is finally available to day in Windows 10 IoT Core’s public preview through the Windows Insider Program. DragonBoard 410c SOC features the Qualcomm Snapdragon 410 processor, plenty powerful for IoT computing needs. Supported capabilities include onboard WiFi and Bluetooth, and DirectX graphics, bringing it one step above other supported ARM platforms. Windows partnership with Arduino was announced at //build/ 2015, making Windows the first Arduino certified OS, and also bringing two Windows-Arduino bridging technologies: Windows Virtual Shields for Arduino and Windows Remote Arduino. Today, the two technologies have been made available as apps on the Windows Store, along with new technologies added to the partnership including Arduino Wiring and direct memory mapped UWP Providers. 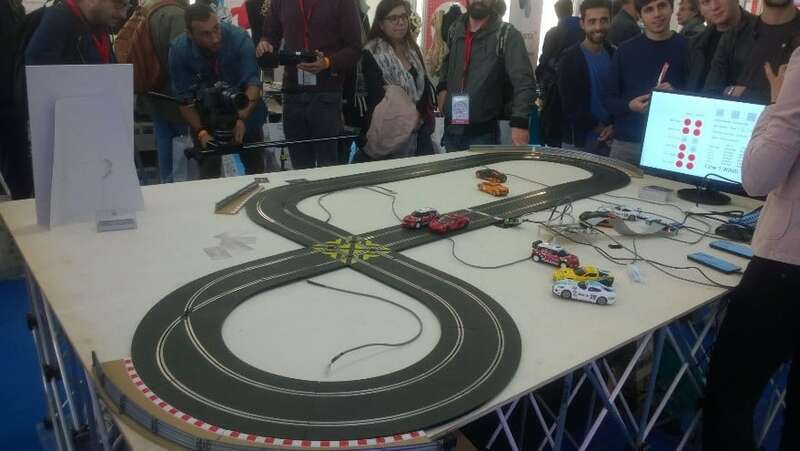 Slot cars racing with Windows IoT Core, Raspberry Pi 2 and Windows Phone. Photo from Windows Blog. A bit of recap, Windows Virtual Shields for Arduino lets an Arduino system leverage sensors and actuators on a Windows 10 devices over USB, WiFi and Bluetooth. A given example is accessing a Windows 10 phone’s accelerometer from an Arduino over WiFi. Windows Remote Arduino Experience, on the other hand, allows you to control physical devices through an Arduino over WiFi, USB or Bluetooth using your Windows 10 devices. One of the newly-added technologies, Arduino Wiring allows developers to link exisiting Arduino resources including popular hardware like the Raspberry Pi 2, with Windows 10 IoT Core Universal Windows Apps. A new direct memory mapped driver model has also been added with the newest Windows 10 IoT preview, promising 60x – 90x increase in speed and can be configured using Arduino Wiring. Announced at Build 2015, Windows 10 IoT Core is an update to Microsoft’ previous OS for embedded system, Windows CE, and is an important part of its vision for a universal Windows experience across all devices. We are looking forward to its development and availability in more devices both from Microsoft (looking at you, Band 2) as well as from its multitude of partners.